How Many Atoms Are There in the Universe? It’s no secret that the universe is an extremely vast place. That which we can observe (aka. “the known Universe”) is estimated to span roughly 93 billion light years. That’s a pretty impressive number, especially when you consider its only what we’ve observed so far. And given the sheer volume of that space, one would expect that the amount of matter contained within would be similarly impressive. But interestingly enough, it is when you look at that matter on the smallest of scales that the numbers become the most mind-boggling. For example, it is believed that between 120 to 300 sextillion (that’s 1.2 x 10²³ to 3.0 x 10²³) stars exist within our observable universe. But looking closer, at the atomic scale, the numbers get even more inconceivable. At this level, it is estimated that the there are between 1078 to 1082 atoms in the known, observable universe. In layman’s terms, that works out to between ten quadrillion vigintillion and one-hundred thousand quadrillion vigintillion atoms. And yet, those numbers don’t accurately reflect how much matter the universe may truly house. As stated already, this estimate accounts only for the observable universe which reaches 46 billion light years in any direction, and is based on where the expansion of space has taken the most distant objects observed. While a German supercomputer recently ran a simulation and estimated that around 500 billion galaxies exist within range of observation, a more conservative estimate places the number at around 300 billion. Since the number of stars in a galaxy can run up to 400 billion, then the total number of stars may very well be around 1.2×1023 – or just over 100 sextillion. On average, each star can weigh about 1035 grams. Thus, the total mass would be about 1058 grams (that’s 1.0 x 1052 metric tons). Since each gram of matter is known to have about 1024 protons, or about the same number of hydrogen atoms (since one hydrogen atom has only one proton), then the total number of hydrogen atoms would be roughly 1086 – aka. one-hundred thousand quadrillion vigintillion. Within this observable universe, this matter is spread homogeneously throughout space, at least when averaged over distances longer than 300 million light-years. On smaller scales, however, matter is observed to form into the clumps of hierarchically-organized luminous matter that we are all familiar with. In short, most atoms are condensed into stars, most stars are condensed into galaxies, most galaxies into clusters, most clusters into superclusters and, finally, into the largest-scale structures like the Great Wall of galaxies (aka. the Sloan Great Wall). On a smaller scale, these clumps are permeated by clouds of dust particles, gas clouds, asteroids, and other small clumps of stellar matter. 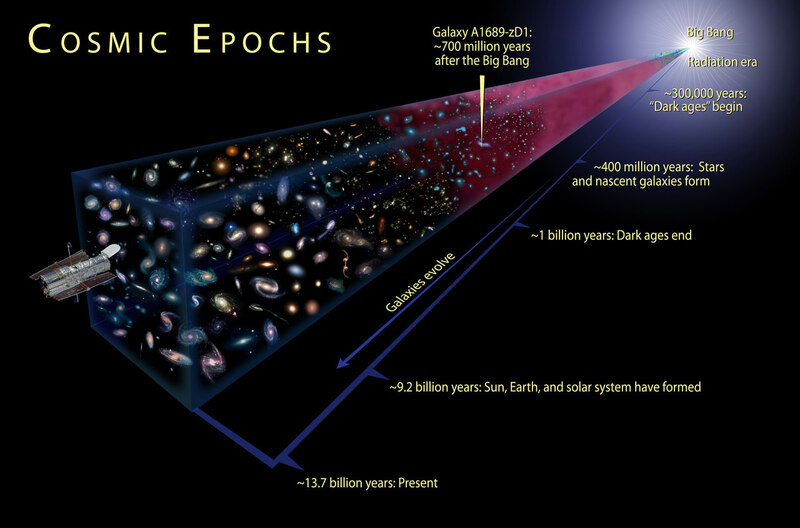 Representation of the timeline of the universe over 13.7 billion years, and the expansion in the universe that followed. Credit: NASA/WMAP Science Team. The observable matter of the Universe is also spread isotropically; meaning that no direction of observation seems different from any other and each region of the sky has roughly the same content. The Universe is also bathed in a wave of highly isotropic microwave radiation that corresponds to a thermal equilibrium of roughly 2.725 kelvin (just above Absolute Zero). The hypothesis that the large-scale universe is homogeneous and isotropic is known as the cosmological principle. This states that physical laws act uniformly throughout the universe and should, therefore, produce no observable irregularities in the large scale structure. This theory has been backed up by astronomical observations which have helped to chart the evolution of the structure of the universe since it was initially laid down by the Big Bang. The current consensus amongst scientists is that the vast majority of matter was created in this event, and that the expansion of the Universe since has not added new matter to the equation. Rather, it is believed that what has been taking place for the past 13.7 billion years has simply been an expansion or dispersion of the masses that were initially created. That is, no amount of matter that wasn’t there in the beginning has been added during this expansion. However, Einstein’s equivalence of mass and energy presents a slight complication to this theory. This is a consequence arising out of Special Relativity, in which the addition of energy to an object increases its mass incrementally. Between all the fusions and fissions, atoms are regularly converted from particles to energies and back again. 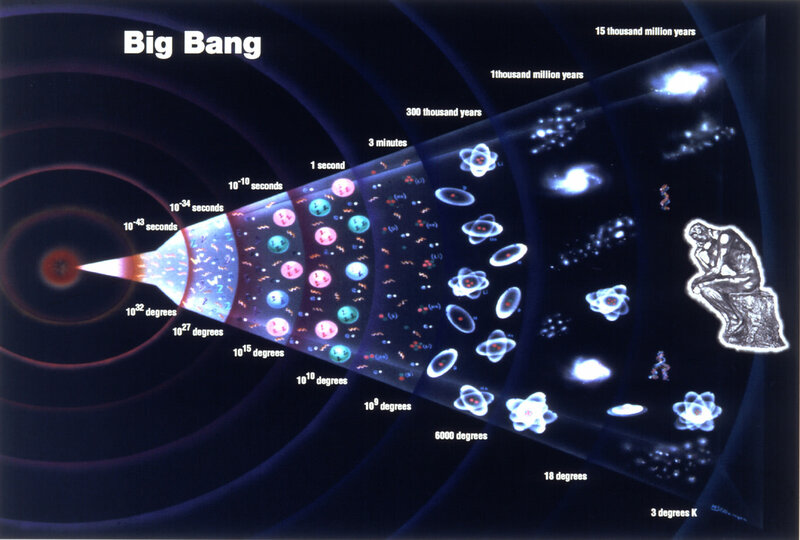 Nevertheless, observed on a large-scale, the overall matter density of the universe remains the same over time. The present density of the observable universe is estimated to be very low – roughly 9.9 × 10-30 grams per cubic centimeter. This mass-energy appears to consist of 68.3% dark energy, 26.8% dark matter and just 4.9% ordinary (luminous) matter. Thus the density of atoms is on the order of a single hydrogen atom for every four cubic meters of volume. The properties of dark energy and dark matter are largely unknown, and could be uniformly distributed or organized in clumps like normal matter. However, it is believed that dark matter gravitates as ordinary matter does, and thus works to slow the expansion of the Universe. By contrast, dark energy accelerates its expansion. Once again, this number is just a rough estimate. When used to estimate the total mass of the Universe, it often falls short of what other estimates predict. And in the end, what we see is just a smaller fraction of the whole. We’ve got a many articles that are related to the amount of matter in the Universe here in Universe Today, like How Many Galaxies in the Universe, and How Many Stars are in the Milky Way? NASA also has the following articles on the universe, like How many galaxies are there? and this article on the Stars in Our Galaxy. We also have podcast episodes from Astronomy Cast on the subject of Galaxies and Variable Stars.